Join a global community of teachers passionate about making a real difference in the classroom! Access high quality professional development from experts in ELT. Visit our page for up-coming sessions, top tips and our webinar library. Oxford Teachers’ Academy courses are suitable for teachers with an initial qualification and some teaching experience. Typically they provide 30 hours of core material, with suggestions for further reading and interesting websites, videos, and blogs for each topic. Completion of Oxford Teachers’ Academy courses is certified by Oxford University Department for Continuing Education. In order to receive a Certificate of Completion, course participants must submit an Evidence of Learning Journal on completion of the course. The Evidence of Learning Journal will be evaluated against the Evaluation criteria. If all criteria are met, participants will receive an electronic Certificate of Completion within six weeks of submitting the Evidence of Learning Journal. 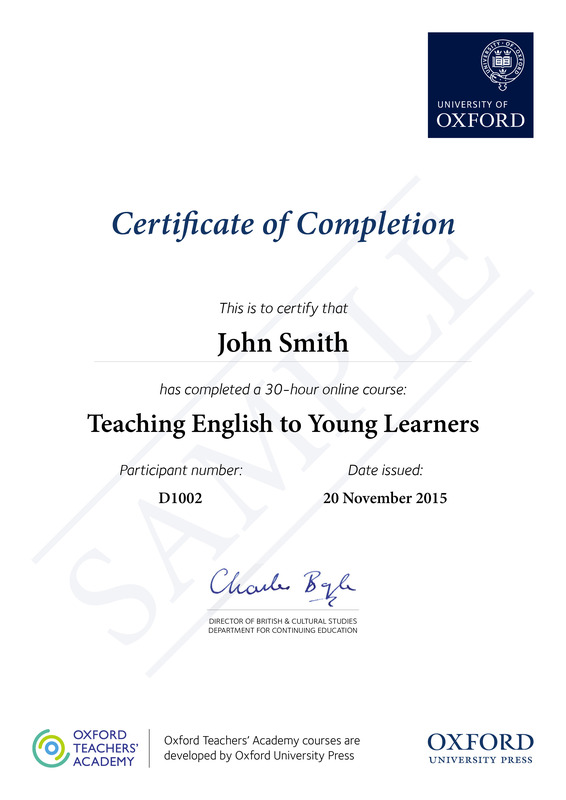 Course completion is certified by Oxford University Department for Continuing Education. The Certificate includes the title and duration of the course, participant name, unique participant number, and the date. In order to complete a course, the participants need to complete and submit the Evidence of Learning Journal. Oxford University Department for Continuing Education will evaluate the responses against a set of criteria. If the submission meets the criteria, participants will receive an electronic Certificate of Completion within six weeks of submitting the Evidence of Learning Journal. Course participants are required to write a short report for each of the sessions of the course. The participants are expected to demonstrate understanding of the content of each session and how they would apply what they have learned to their own classroom practice. Typical tasks might be to design or evaluate a lesson plan, describe a classroom activity, reflect on an aspect of classroom methodology, or apply a theory or principle of language teaching to classroom practice. The final part of the Evidence of Learning Journal requires participants to complete a ‘Next Steps’ statement in which they briefly describe three changes they plan to make to their own teaching practice as a result of what they have learned on the course. The Evidence of Learning Journal I am submitting is entirely my own work, except where otherwise indicated. It has not been submitted, either wholly or substantially, for any other Oxford Teachers’ Academy course or for any other course elsewhere. I have clearly signalled the presence of any quoted or paraphrased material. I have acknowledged appropriately any assistance I have received in the writing of my Evidence of Learning Journal. I have not had assistance from any professional agency or other party. The Evidence of Learning Journal complies with the terms of the Declaration of Authorship. Each session report should be 250-300 words in length. The Next Steps statement should be 150-180 words in length. demonstrate an understanding of the contents of the course and apply what has been learned to classroom practice, where appropriate to the task. The report is clearly expressed and conveys the writer's message in a way that can be readily understood. Inspire your teachers. Improve the learning outcomes for your students. Oxford Teachers’ Academy provides institutions with the tools to implement and monitor Continuing Professional Development programmes for their staff. Up-to-date content, expert input from leading researchers and practitioners in the field, and access to current articles from ELT Journal will make it a must-do training course for all teachers wishing to develop for themselves and their students. If you are interested in running an Oxford Teachers’ Academy course with a moderator in your institution, you can buy the moderator access from your local bookshop or contact your local OUP educational consultant for more information. It’s just another virtual classroom, where teachers are participants of an online course. The institution will nominate a moderator for the group - often a senior teacher or a director of studies. The moderator will give participants in the institution a joining code, so they can all be members of the same class. collate all Evidence of Learning Journals on behalf of the participants and submit them.